Matthew Bourne's "dance play" Edward Scissorhands is a story without words. Like the great silent-film directors, British choreographer/director Matthew Bourne has fashioned himself as a master of non-verbal story telling. From his popular theatrical adaptations of ballets such as Swan Lake and The Nutcracker to original dance plays such as The Car Man and Play Without Words, Bourne has successfully merged the crucial elements of dance and theater into his own brand of live performance, one that has garnered him numerous awards and one that audiences of all kinds have embraced. 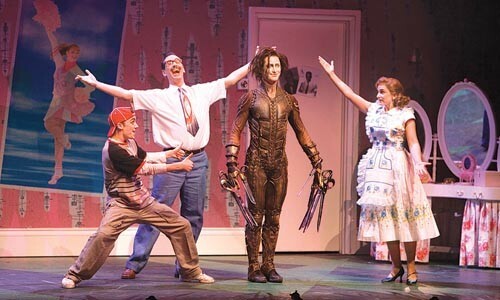 In his latest touring production -- an adaptation of Tim Burton's Edward Scissorhands -- Bourne turns the 1990 film about an innocent boy with scissors for hands into a grand dance-theater piece with the production values of a Broadway play. Bourne's stage version broadly follows the movie's storyline but adds new characters to the fictitious town of Hope Springs, and several new scenes including a fantastical topiary sequence and more on how Edward came to have scissors for hands. "I wanted to know why he [Edward] existed in first place," said Bourne in a television interview. "The story begins with the death of a young boy by lightning while playing with scissors. His father in his grief feels he needs to replace his son and being an inventor of sorts he creates a boy and he has scissors for hands." Set in 1950s America, Edward Scissorhands explores themes of acceptance, love and loneliness. 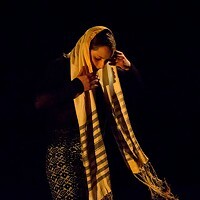 A cast of 27 dancers/actors from the critically acclaimed original London production brings the play to life. "What we enjoy doing is quite old-fashioned really: We enjoy telling stories," says Scott Ambler, associate director of Bourne's New Adventures company, speaking by telephone from Los Angeles, the second stop on the production's 12-city North American tour. "Any non-verbal means of doing that we are happy to use, whether that is dance or physical mime." Bourne says he was drawn to adapting Burton's film by Johnny Depp's almost silent-film-style portrayal of the title character as the "ultimate outsider expressing himself through movement rather than words," and by composer Danny Elfman's "achingly romantic" original score. For his stage production, Bourne turned to the movie's original screenwriter, Caroline Thompson. Regular collaborators include Terry Davies, who composed, arranged and adapted some of Elfman's score for the production, and Tony Award-winning set and costume designer Lez Brotherston, whose stunning sets and costumes have received glowing reviews. While devoid of spoken dialogue, Bourne's dance plays are noted for their accessibility to non-dance audiences. Bourne's uncanny use of both body language and full-out dance movement leaves no mystery as to what is happening onstage. "We are the dance company that people that don't like dance enjoy," says Ambler. "We don't stick to one particular balletic style. We use social dance and other forms that people are familiar with." Ambler adds that Edward Scissorhands gives Bourne a further advantage with audiences. "People, even if they haven't seen the movie, have a rough idea of what Edward Scissorhands is about. That gives you an in," says Ambler. "Once you have them on your side you have room to be a bit more subversive with the story." Ambler -- who also plays Bill Boggs, the father of the family that takes Edward in -- promises the family-friendly show will provide plenty of what audiences have come to expect from New Adventures: a unique visual experience, humor and a lot of great dancing.